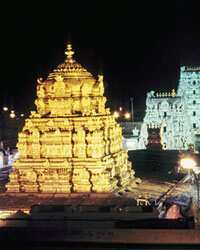 Unable to visit Tirupati for the ongoing nine-day Brahmotsavam festivities? If Reliance Communications Ltd or R-Com, India’s second largest mobile phone services provider, has its way, you can watch the proceedings at the country’s richest temple live or recorded on your mobile phone. Techzone has an exclusive tie-up with Tirumala Tirupati Devasthanam (TTD), the administrative body that runs the temple, to broadcast video images of areas around the temple and within the temple complex on mobile phones. Videography is not allowed within the sanctum sanctorum. Customers have the option of viewing live or pre-recorded religious events at Rs15 for a five-minute clip. The only catch is that customers need to have mobile phones that support the so-called wireless application protocol. The service is expected to go on stream within the week. Naveen Bhandari, chief operating officer of Techzone, expects the Tirupati broadcast service to find mass demand given the fact that some 100,000 devotees visit Tirupati every day. “This service will enable them to watch the pujas live on their mobile phones if they are unable to make a trip all the way to the temple," he said. An R-Com spokesperson said services such as this would help increase its non-voice based income, which is currently at 10-15%. Revenues from the service will be shared between R-Com, TTD and Techzone. “The time is not far when value-added services will form a major chunk of the revenues of mobile service providers, considering similar trends have occurred in other developed countries," said Alok Shende, tech and telecom head at the local unit of Datamonitor Plc., a data, analytic and forecasting firm. Trade body Internet and Mobile Association of India expects the telecom value-added services market in India to grow by 60% to Rs4,560 crore by the end of the current fiscal from Rs2,850 crore in the year ended March. Techzone is in talks with the administrations at other temples such as the Siddhi Vinayak Temple in Mumbai to extend the scope of its telecast offerings and is exploring possible tie-ups with other telecom operators including Bharti Airtel Ltd and Vodafone Essar Ltd.